I bought this kit to see if I could get an idea I had prototyped. Having moved on from being an electrical engineer into Marketing and later Management, I was apprehensive as to whether I could still pull it off. This kit was a joy to use, taking me back to my student years and walking me through the paces of building and programming from scratch in such an easy way. 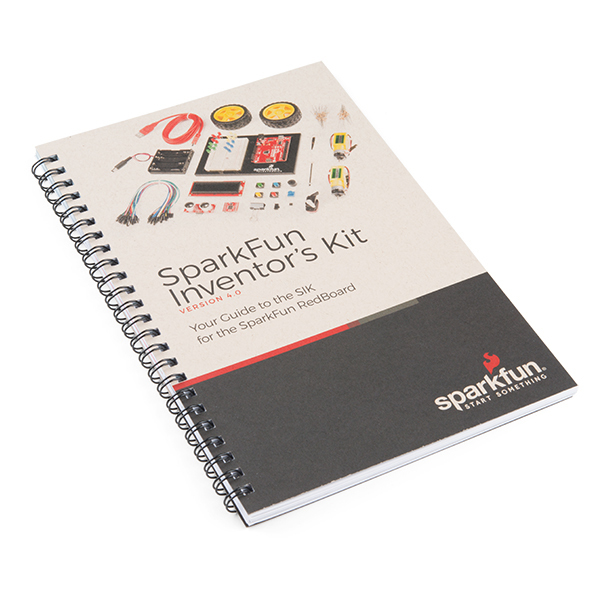 It's clear to see that the team at SparkFun really understands what it takes to introduce makers to the world of embedded systems and programming. I can only recommend this kit. Excellent job! Very cool kit with great manual/instruction booklet. I went through a number of these projects on a family vacation and we built the final project - the mobile robot. Everything worked as advertized and we had no problems. I do have two suggestions, though. First, it seems odd to include the paper clip instead of a caster wheel. Also, it was quite disappointing that the manual did not include circuit diagrams for any of the projects. These diagrams are essential to teaching someone how the circuit works. The wiring diagrams are great, but they are nearly useless for this purpose. If these were included the in the manual, it would truly be outstanding. Still, I loved the kit and the box in came in. Very clever to use two-sided tape to mount the motors. Love that absolutely everything you need (except scissors) was included in the kit to build everything. 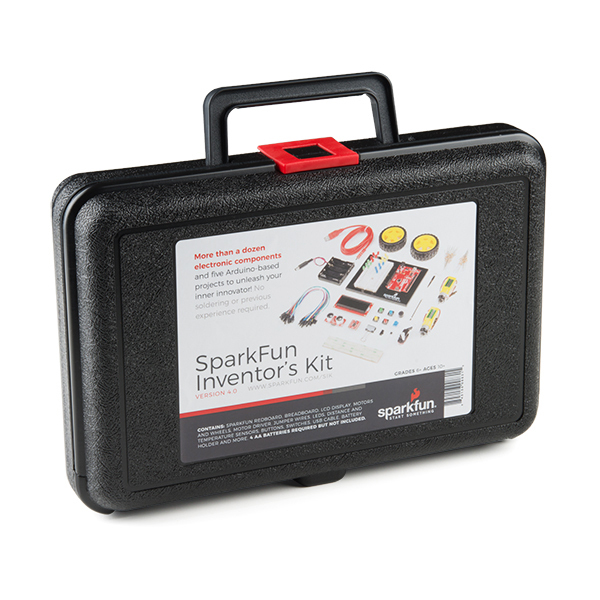 SparkFun rocks! The projects are great. I had a lot of fun going through the booklet. Each lesson builds on each other and when you are done you will feel like a pro. All of the parts feel rigid and durable, great for students. 8 year old loves it! 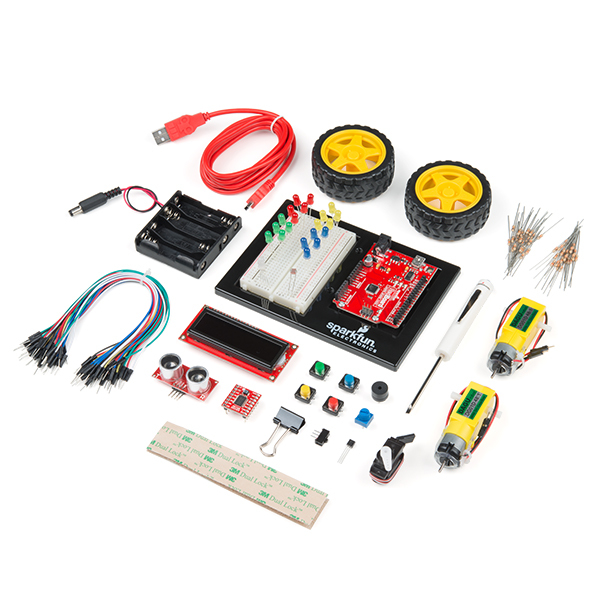 Great little kit to get kid's interested in electronics and coding. My 8 year old was completely excited by this kit and took to building the hardware very easily. Coding is something he will have to learn slowly. Good quality stuff and well worth the price. Good mix of parts to play with and great instructions. The Experiment Guide is well laid out and does an excellent job of walking even inexperienced people though how all of the components work and how to start with basic programming. Great way to get into "It"
I enjoyed how the projects built on each other. There are a few bugs in the code...but that just added to the fun of figuring out how to get it to work. Oh Baby! I'm having fun. Oh Baby! is my sailboat. With the SparkFun inventor's kit and an Arduino 9 axis sensor shield I have begun to build a heel/pitch/direction instrument with LCD display, I'm having fun learning but find it a bit frustrating getting information on the Arduino shield for now. Part of it is just being new and part seems to be lack of good documentation for that particular shield. The SparkFun story motivated me to buy from your outlet and the kit has opened my eyes to a whole new world of adventure while the snow is falling. Thanks to you and your team for providing a quality product at a reasonable price. Great kit to teach electronics. This is an excellent update to the SIK. I like that I can use this kit to teach a bit about robotics, which students seem to enjoy. The only criticism is I wish the kit included more sensors like the flex sensor from SIK3. They would have made some of the later projects more interesting. I couldn't have asked for a better starter kit. It's my first time working with Arduino. After working my way through all of the tutorials, I knew everything I needed to make the exact project I wanted to. I'm impressed with the parts included and especially the instructions. It was all much easier and more fun than I expected, which is a credit to the people who put this together. I do wish they included just a few more jumper wires; there aren't enough if you actually want to combine all of the parts into one project. A small niggle. Super easy to use, super fun to work on, has tons of different things to try with, absolutely outstanding! Would highly recommend. Gives you enough of a guide to follow in the manual. Leaves enough room for you to research and learn more things on your own. Awesome Product! Easy to use with very good explanations. Thanks for create this product. Please think in to create more kits. We bought this for our 12 year old son who loves coding on the computer and has expressed interest in learning about electronics. It is just at the right level for him. He is completing the experiments by himself without any help from us, or at least from me! He may be getting some help from Dad but not much! Very Clear and easy to understand instructions, though for a more advanced understanding of programming you might want to view some u-tube tutorials. Lots of fun to play with and learn the meaning and uses of different Electronic components.Love it. Our Scout troupe (Venturers) has thoroughly enjoyed building and experimenting with this kit. This has opened a new world to them.